Onions are one of the most popular and versatile vegetables in the world. They can be eaten raw, sautéed, baked, grilled, stuffed, and pickled… or, if you’re old school like me, fried up with some crispy schmaltz to make gribenes. This humble, hearty vegetable moved Julia Child to say, “It’s hard to imagine a civilization without onions.” To be sure, our cooking would be significantly different if the onion did not exist. Onions are a vitally important part of our culinary history, and it seems only fitting to give them their very own post here on the Shiksa blog. From history to chopping to stopping the tears, let this post be your one-stop onion shop! Onions are one of the most ancient food sources on the planet. It’s impossible to know exactly when they first popped up on the culinary scene; most historians agree that they have been domesticated and cultivated for at least 6000 years, possibly longer. 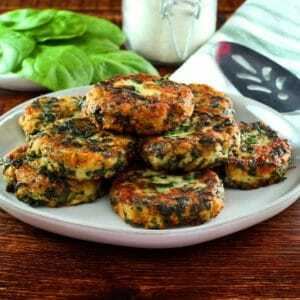 They were likely a prehistoric dietary staple for our hunter-gatherer ancestors. Onions are mentioned on ancient Babylonian tablets in recipe form dating all the way back to 1700-1600 BCE. 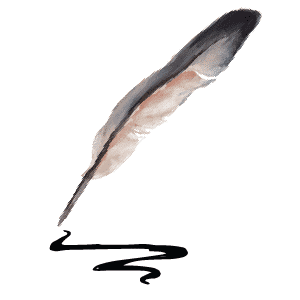 They’ve been used throughout history for a variety of purposes, primarily in cooking. 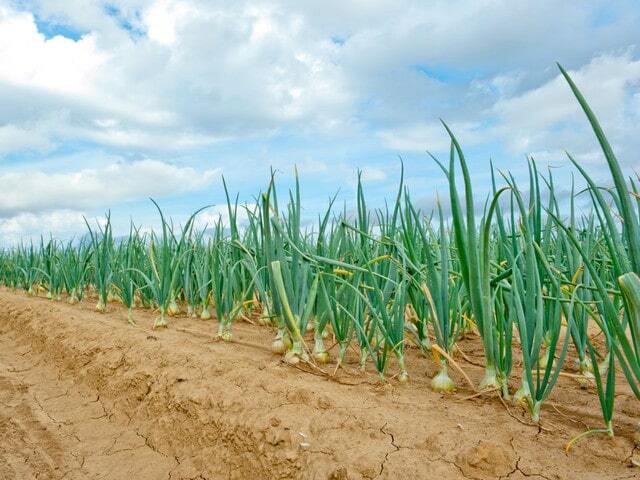 Part of the onion’s popularity throughout the centuries is its versatility; it can be grown in a wide variety of climates and soils. Ancient Egyptians believed onions symbolized eternity; they were placed on altars and buried with the Pharaohs. Excavated tombs have revealed mummies with onions placed on various parts of their bodies. Onions were used to feed the workers constructing the pyramids; they also appear on pyramid paintings. In Pompeii, remains of an onion basket were discovered in a brothel—apparently, back then they were thought to encourage “carnal desire.” Nowadays they seem to have the opposite effect (eww, onion breath?). Onions have a long medicinal history. Ancient Roman naturalist Pliny the Elder believed that they healed sores, vision problems, toothaches, and dysentery. Gladiators were massaged with onion juice before walking into the arena, believing it promoted strength. In 6th century India, onions were deemed helpful for the heart, joints and indigestion. 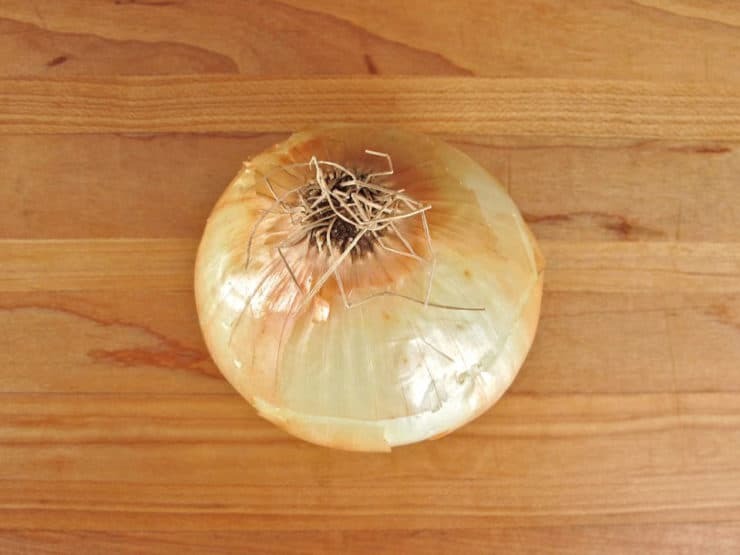 In Elizabethan times, onions were used to soothe blisters and hemorrhoids. Science has caught up with these antiquated beliefs, and we now know that some of these early medicinal theories were not far off base. 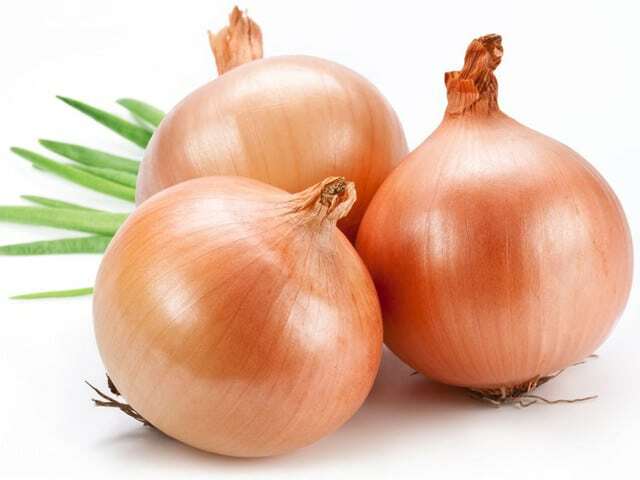 Onions are proven to be high in Vitamin C and quercitin, an antioxidant flavonoid that may help to lower cholesterol and the risk of heart disease, as well as certain types of cancer. Yes, that’s me, wearing my trusty pair of onion goggles. What, you thought I was one of those slick, flawlessly groomed Food Network peeps? Nope, I’m a homespun kitchen nerd all the way. And I do love my goggles! It’s inevitable—when you slice a raw onion, your eyes will tear up. With my sensitive eyes, I need all the help I can get in this department. There are plenty of wives tales and folk remedies out there to stop the tearing. One suggests placing a chunk of bread between your teeth while performing your chopping and dicing (didn’t work for me). 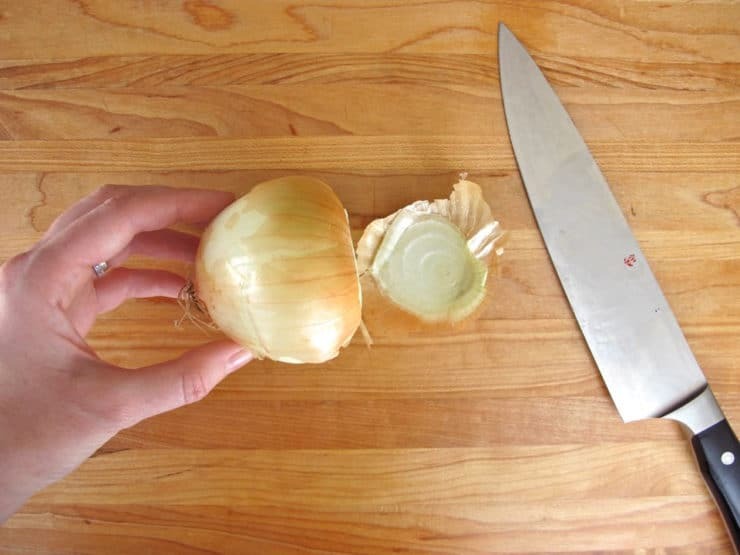 More practical tips include using a sharp knife to ensure a clean cut, placing exposed areas down against your cutting surface, and chilling your onion in the refrigerator for a few minutes before cutting (this last one actually helps a bit, but doesn’t solve it completely for me). Do you have any tips for combating onion tears? 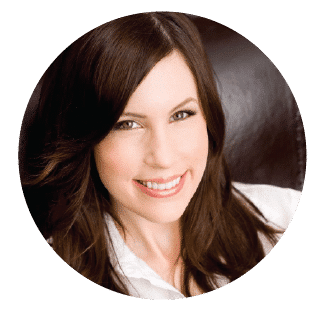 I’d love to hear any methods you’ve found to be helpful, please comment below and let me know! 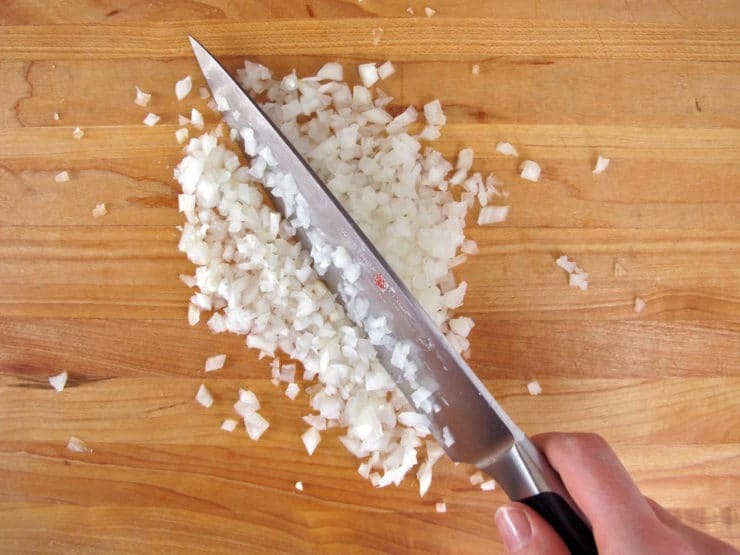 Meanwhile, here’s a quick tutorial on the proper way to easily chop and mince an onion. On the top of the onion, there will be a papery looking knob. On the bottom of the onion, you'll see a root end with little root threads hanging off. You'll want to keep the root end of the onion intact as you move forward, it will make chopping the onion easier. Slice off the papery top of the onion and discard. 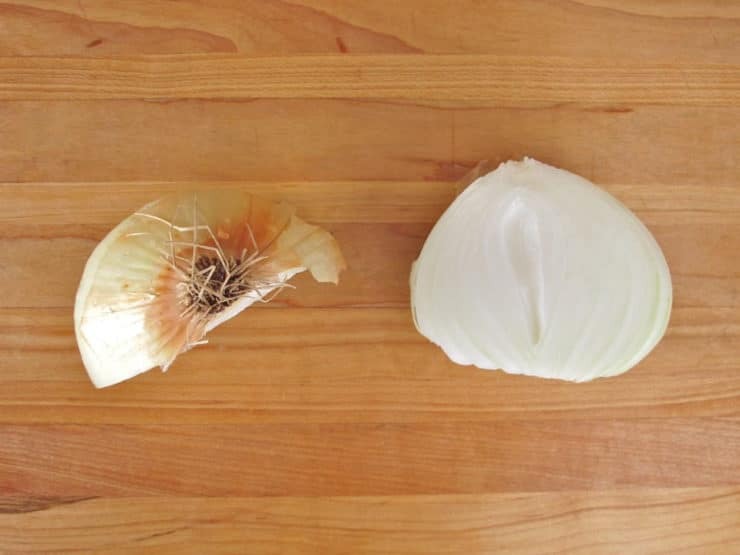 Slice the onion in half length-wise, slicing through the thready root knob to cut the onion into two equal halves. Start with one half of the onion. Lay the flat side down on your cutting board. 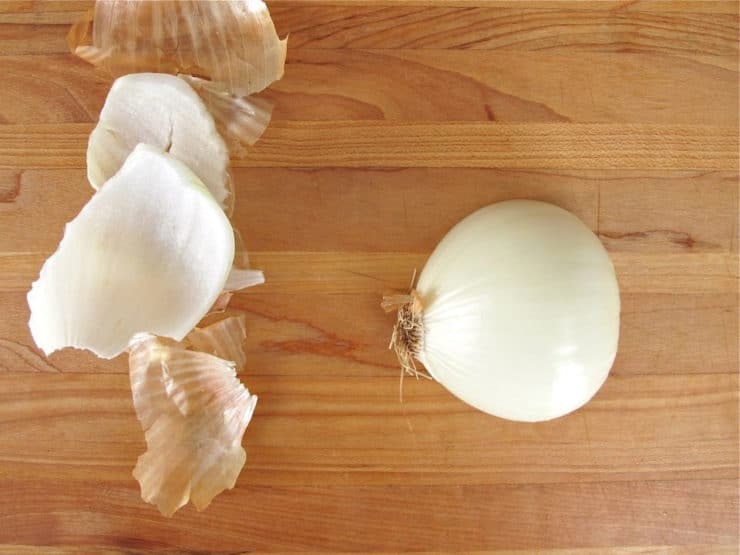 Peel off the papery outer skin and any blemished outer layer to reveal a clean onion. Discard the skin and outer layers. With the flat side down, slice through the onion vertically several times, stopping just shy of the root end. The root will help hold your slices together, which will make dicing easier. 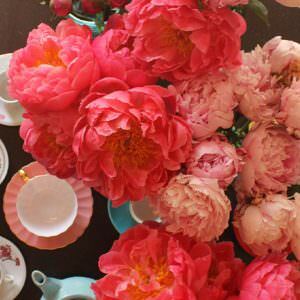 Don't worry if a few edge pieces fall away from the root, no big deal- you can chop them later. 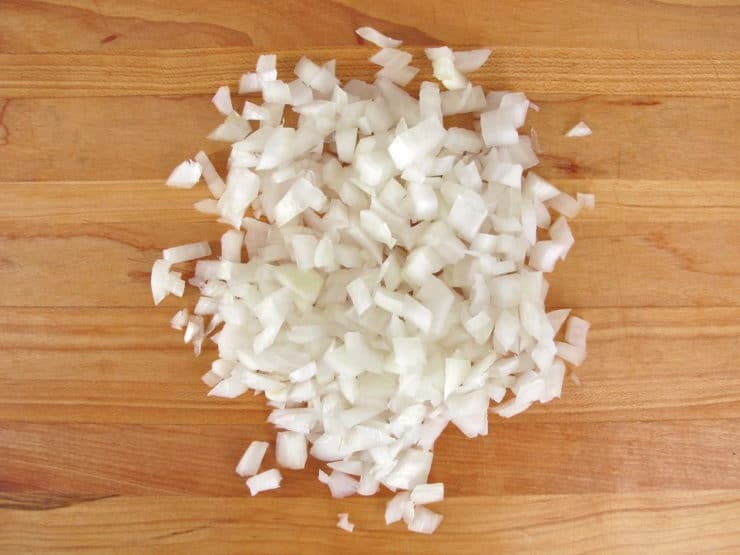 Give the onion a quarter turn and slice thinly in the opposite direction to create your chopped, diced pieces. When the onion becomes too small to slice comfortably, turn it flat side down and continue chopping all the way to the knob. Discard the knob. Repeat the process for the remaining onion half. Some recipes call for a smaller dice, also known as a mince. 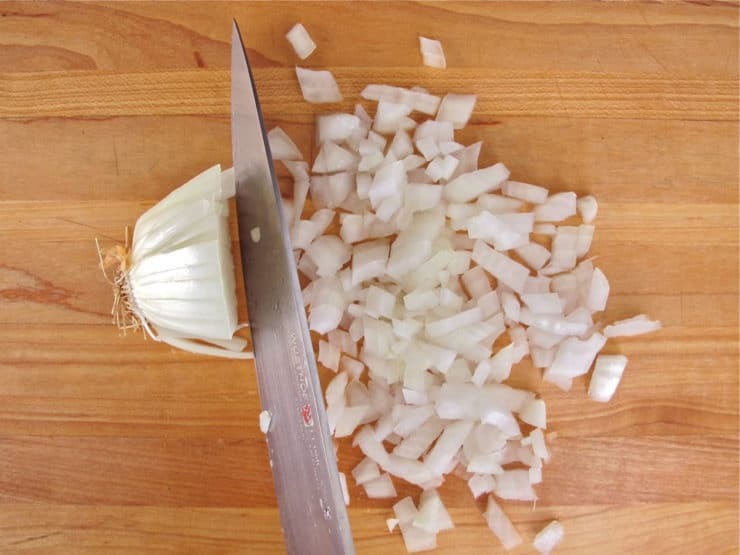 Once you have finished dicing the onion as outlined above, you can easily mince it by running your knife through the diced onions, chopping them into even finer pieces. Think Martin Yan, Yan Can Cook style (anybody else remember watching him?? One of my favorite shows as a kid!). Chop chop chop! Continue chopping through the pile until you achieve the texture you desire. Kiple, Kenneth F. & Ornelas, Kriemhild Conee (2000). The Cambridge World History of Food, Volume 1. Cambridge University Press. Rupp, Rebecca (2011). How Carrots Won the Trojan War. Storey Publishing, North Adams, MA. “Quercitin.” Medical Reference. University of Maryland Medical Center, n.d. Web. 06 May 2013. I use the ceiling fan… just saying it blows the onion fumes away from my eyes. My little brother just did a science experiment on tears and freezing the onion or putting it in a fridge before chopping helps alot. If I don’t have a thoroughly chilled (not just “in the fridge for a few minutes” – but a truly refrigerated) onion, the only thing that prevents my eyes from overflowing with tears is if I hold my breath when slicing them. Goggles do not help for me, if I breathe when chopping/slicing an unrefrigerated onion. 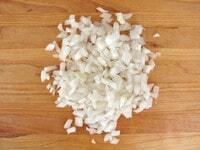 If the onion has been thoroughly chilled, then there is almost no ill effect from slicing/chopping the onion. Or, I can stand over the onions and chop all day if I hold my breath (tho I can’t hold my breath long enough to slice/chop up more than just one onion!). If I stand over the unrefrigerated onion and breathe as I chop, I will barely be able to see between the tears. I have not let a fully refrigerated onion reach room temp to see if that makes a difference. I do suspect that something in the onion dies when it is refrigerated, much like the flavor of a fresh tomato suffers once the fresh tomato has been refrigerated. I am intrigued by the onion goggles. Can these same goggles be used for swimming? Or are they a special Kind? Please respond. Hi Nettie– no, they are not waterproof, they have a soft foam around the edges. I suppose you could use regular water goggles too, but these are a bit more comfortable. Put a piece of sliced sandwich bread in your mouth and let the bread hang out as you slice. The bread will gather most of tear causing fumes and flavor the bread at the same time. i need goggles for my cat. the poor thing sneezes and his eyes start tearing whenever i cut onions! he gets out of the kitchen as soon as he smells it. I’m gonna tell you my secret so you can chop an onion and not cry. Bite a match. Yeah, not lighted-on, just place it in your mouth between your teeth, with the phosphorous side on the outside of your mouth. I don’t remember where I heard this tip (maybe in the “The Help” movie, Idk). Many many things make me cry, but not onions! My husband does cry from onions though – so he uses that onion-chopper thing and that helps. I do the chopping, dicing of the onions right below my exhaust fan. It works! I tried that – no luck. I tear up so badly that I will avoid using onions, or buy them chopped. Only thing that works for me is to leave the house while my husband chops them outside… I get a sack of onions and freeze them diced and ready to go. 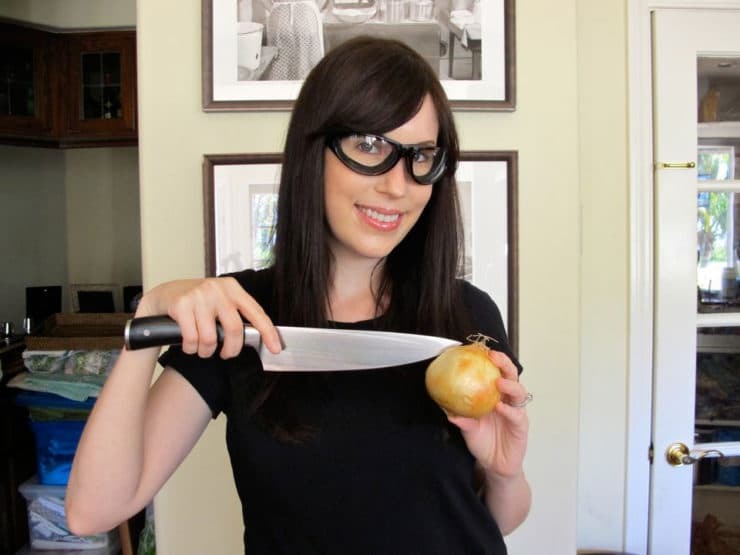 OTOH, Efrat Effie Rebish wears goggles when making her famous horseradish! 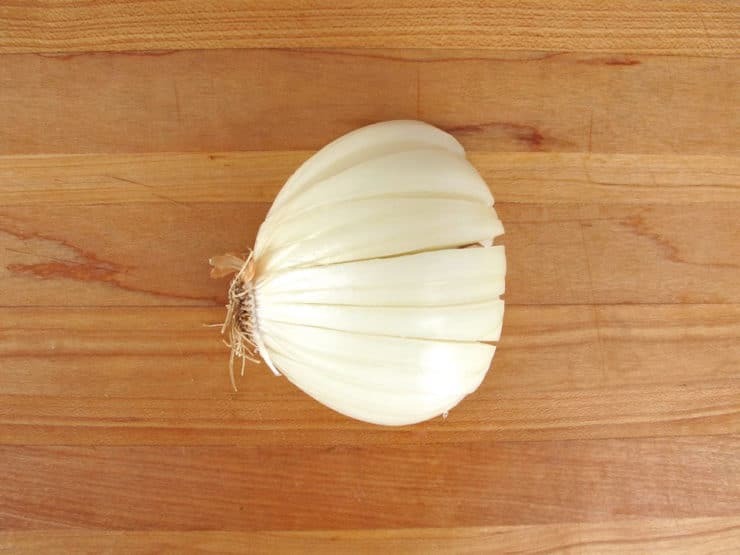 The potent odor and tear inducing chemical produced by an onion is activated when you cut into it’s root. If you look at the cross section of an onion you will find that the root end (i.e. the bottom where the whisker like strings are exposed) is connecd to the inner bulb, which is the epicenter of the stench. Simply cut your onion from the top end and as you get closer to the root end slice the outer layers and avoid opening the stench bomb all together! 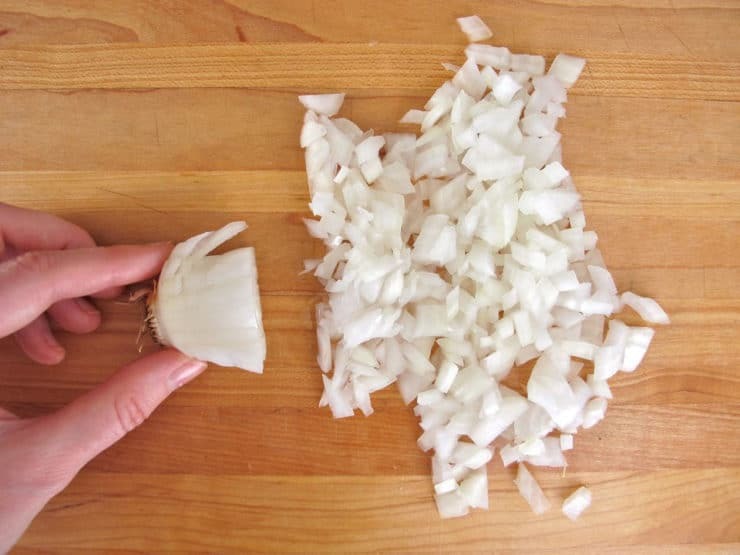 With this method you will slice about 75% of the onion, and the other 25% will be discarded. I ate Polish and Czech food my whole life and cook in a restaurant for a living. I´m immune to the onion fury. If only I could look so stylish…love it! No crying for you. Mince ´em, dice ´em, everywhere you can slice ´em. Love the glasses.